Associated Press reporter Verena Dobnik may be guilty of intentional mis-represention in an AP story published Oct. 8, 2012 in which she said she saw a tattoo on Elie Wiesel’s left forearm. The story was carried by many news outlets, including the Washington Times, Seattle Times, Huffington Post, Salon.com, the Bend Bulletin (Oregon), The Sun Chronicle, Flagstaff Today, Deseret News , Yahoo news, The Times of Israel (and other specifically Jewish news media). “Usually, I don’t show it,” he says. Was this extraordinary claim checked out for accuracy by the Associated Press before running the story? In all of his 62 years in public life (since 1950) Wiesel has never exhibted publicly a tattoo on his left arm. 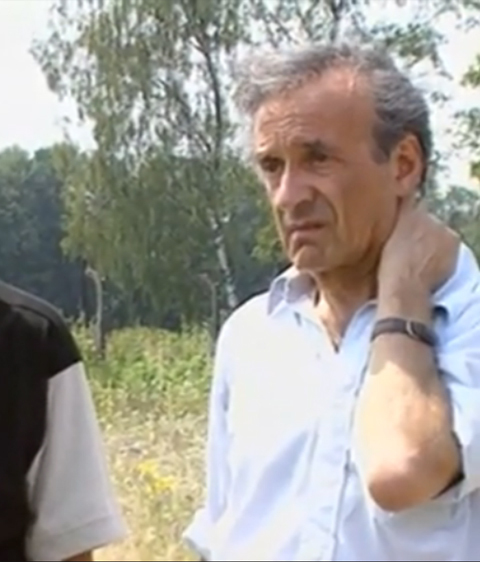 Furthermore, there are some photographs taken over the course of the years in which his bare left arm can be clearly seen (sometimes in bright sunlight, as in the unretouched photo here taken from Wiesel’s own film about a return visit to Auschwitz) and none show any kind of mark on his arm, let alone anything that resembles an Auschwitz concentration camp number. Dobnik’s claim is so surprising that it should have garnered excitement from the mainstream media, but just the opposite happened – it was totally ignored and some publications that had originally published the story may have removed it from their online news sites! For this reason, I doubt that this incident ever actually happened; I think it very likely that Verena Dobnik added it to her interview simply because she wanted to. I can’t give her motivations, which may be quite complex. But this part of her interview should have set off a red light for the AP editors, and some questions should have been asked. Not just the seven I list below, but also why she should mention it at all if no photograph proving what she says she saw accompanies the article? I do not, at this point, speculate that Wiesel drew something on his arm and then gave Dobnik a quick glance at it. It seems far more likely to me that Dobnik, as other journalists have done, just added it to her story on her own. I have to add that Wiesel’s handlers and publicity team have not killed the story – so he doesn’t disapprove of it. (At left is a detail of a photograph of the left arm of Auschwitz survivor Sam Rosenzweig.) If Wiesel is willing to show his tattoo to the reporter Dobnik, why won’t he show it to the general public and end the questions and swirling speculation about “does he or doesn’t he” have what he says he has? This kind of tease from Ms. Dobnik cannot go unanswered, especially from Elie Wiesel Cons The World where we have been asking this question for two and one-half years – since July 2010 – without ever being shown even a picture of Wiesel’s alleged tattoo. I therefore do not believe this reporter’s story and accuse her of journalistic fraud. She and Mr. Herschaft are clearly biased reporters who favor, and even specialize in, the traditional ‘holocaust’ narrative. I will register this complaint in a formal way with the Associated Press and I urge you readers to do the same. Don’t sit back and expect others to work miracles on your behalf – take action. The more the Associated Press hears about this, the better. Does she know what a “Nazi death camp number” looks like? She apparently doesn’t know that Auschwitz was the only German concentration camp that tattooed prisoners, so there is no such thing as a “death camp number,” only an Auschwitz camp number. Why does she and the AP continue to call Auschwitz a “death camp” when so many survived, along with their tattoos? How does she know that Wiesel showed his tattoo to President Obama and Chancellor Merkel in 2009 during a visit to Buchenwald? The implication is that she had to learn it from him, during the interview, but she doesn’t include this in her report so we don’t know. How many other mistakes has this AP reporter made in her dire ignorance of what she is writing about?